It used to be that piles of photographs taken by the common man by film would remain in the store envelope stashed away in a drawer, having been looked over once or twice, then seemingly forgotten forever. More serious enthusiastic photographers would use slide film, not print, and organize the slides with much more care, putting them in carefully labelled boxes for safekeeping in a hall closet. Eventually they would become all but forgotten, perhaps relegated to the family attic. But, lets start to think a little bit about what we're leaving behind, as amateur photographers. We are sometimes too self-depreciating, thinking that our pictures aren't worth anything beyond ourselves, but consider - no matter who you are, if you take a lot of photos of different places at different times through your life, your effort should be preserved to survive and be enjoyed by all, long after your demise. Photographs and videos are an important record of where we've been as a collective humanity - one of the best ways imaginable through which the past can be brought into the present. I can think of no better example than the work of a not so famous amateur photographer by the name of Charles W. Cushman. He was a man of modest means, but had enough to travel all around, and he made it his special interest to photograph everything wherever he went, and, just as important as the actual taking of his pictures, he meticulously catalogued every picture and built a literal treasure chest of over 14,000 slides which he wanted to leave behind for the world to enjoy. He has left us with a life's journey through America between the years 1938 to 1969, which to me is not only totally enjoyable, but extremely important. From this vast collection of one man, we get an incredible sense of immediacy of what each passing year looked like in the various places Cushman visited. Think, for example, how important this would be to Film-makers, who need absolutely authentic pictures from distant times and places to help them establish the look of the times. Now, as you browse through the Cushman Collection, you'll notice how each picture has been carefully tagged by time, place and content, so that when you click on the tag "Bohemians", you get one collection of photos that includes these kinds of people as a subject. This gets back fundamentally to my posting from last month "How to Store Your Pictures". This is fundamentally what you want to do, and the most basic filing function of your computer makes this extremely easy, and unlike film or slides, it takes up no additional living space. But wouldn't it be neat if you could also sort and tag all your pictures every which way, by place, by time, by topic, by people, etc? Well, of course you can! Computers are extremely good at this kind of thing - known as cataloguing / database work, it's one of the very first useful things that the earliest computers were used for. The screenshot at the top of the page shows a program I use for doing this very thing - called "digiKam". Remember how last month I showed you how to organize your pictures at a fundamental level using nothing more than your basic Windows File System? 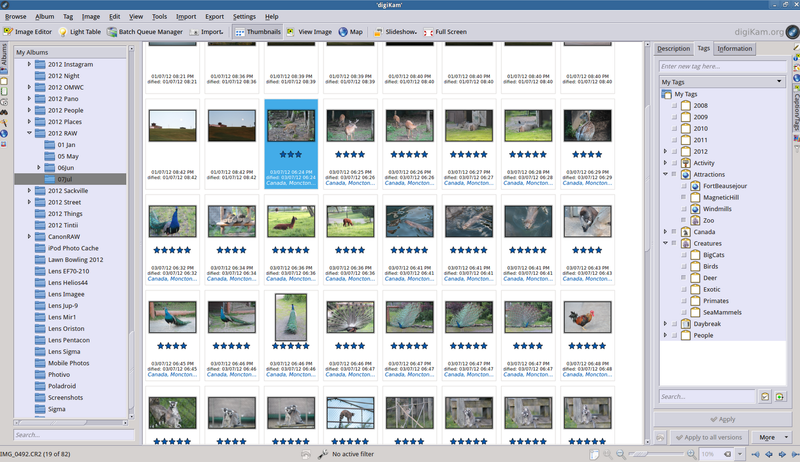 Software like digiKam now takes this first crack you did at organization and enhances it with "ratings and tags" that actually work the very same way as the Cushman Archive. On the left of the screen, you see a portion of my basic Windows File Structure as I've always maintained it. In the centre, you see thumbs of a portion of my collection, and on the right, you see the Tagging system I've applied to the collection, which saves itself in it's own database as I build upon it. Chances are, you don't need to use digiKam; most likely the software that came with your camera has something on it that will do exactly the same thing. Check it out. With a little bit of time, effort and fun, you can build your own Museum Collection as you go, just like Charles Cushman did, and this is something that you in turn can bequeath to your favourite University or Museum.